Melbourne researchers are leading an international trial that could improve the survival rates of very preterm babies and decrease their risk of developing chronic lung disease, a condition that may have life-long consequences on their breathing and general health. The trial is being led by the Royal Women’s Hospital in partnership with the Murdoch Children’s Research Institute (MCRI) and will involve 1060 babies across Australia, New Zealand and Canada. The announcement marks the launch of this year’s Miracle Mums Appeal which will raise much needed funds for research into pregnancy problems and improving the survival and health of newborn babies. Worldwide, approximately one in two babies born before 28 weeks’ gestation will die or develop bronchopulmonary dysplasia (BPD) – a chronic lung condition associated with brain development problems and breathing difficulties later in life. In the new trial, doctors are combining a steroid medicine with the existing treatment of surfactant, in the hope this will reduce inflammation in the lung and prevent the development of BPD. “Despite everything we can now do to help these babies, the incidence of BPD hasn’t improved in recent decades,” Lead researcher Dr Brett Manley, from The Royal Women’s Hospital said. “Tackling BPD is a top neonatal research priority,” Dr Manley said. “Early research in smaller trials has shown a dramatic decrease in BPD with the addition of steroid to surfactant. We are hopeful we will see similar results in this much larger trial. The introduction of surfactant as a treatment in the late 70s and early 80s was a major advance as it dramatically improved the survival and health of babies by helping them breathe. Surfactant is given directly into the lungs of babies and helps to keep the tiny air sacs of the lungs open. However, since then there has been no major advancement in reducing the incident of BPD in very preterm babies. The Preventing Lung Disease Using Surfactant and Steriod (PLUSS) trial involves giving very preterm babies born before 28 weeks a steroid treatment directly into their lungs through a breathing tube, coupled with their usual dose of surfactant. The babies will then be assessed at 36 weeks for signs of chronic lung disease of prematurity. Currently the PLUSS trial is operating on a small grant from the MCRI but urgently needs funding to ensure its continuance. To support the PLUSS trial, please donate to the Miracle Mums appeal. Zoe Starr and Luke Mitchell’s twins Otto and Sid are involved in the trial. Ms Starr had been trying to fall pregnant for a number of years, had experienced miscarriages and was in the process of starting IVF when she fell pregnant with twins. At 25 weeks into what had been a perfect pregnancy, Ms Starr spontaneously went into labour. She was transferred from Geelong to the Royal Women’s Hospital and gave birth 21 hours later. Otto struggled to breathe on his own and was on breathing support for the first five weeks of his life. “Our boys have benefited from lifesaving treatment that would have been tested on other babies before becoming standard treatment for all babies,” Ms Starr said. “We wanted to be involved in the PLUSS study so that hopefully they and future babies will benefit from this new treatment that potentially helps babies’ lung development and prevents chronic lung disease. 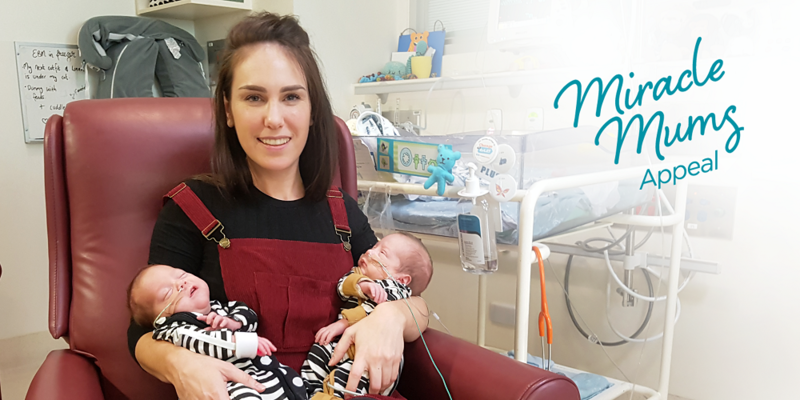 Donate now to the Miracle Mums Appeal and help fund research into improving the survival and health of preterm babies. Research published last year by the Women’s Professor Lex Doyle showed that children born prematurely in 2005 had higher rates of BPD and lower lung capacity at eight years of age than children born prematurely in the early 1990s.